Nitecore UL109 dual-slot USB charger is designed exclusively for Leica camera battery, can charge two BP-DC15-E batteries simultaneously, LCD display provides real-time information on overall charging status. Fast charging. 2 hour to fully charge 2 batteries. This lightweight and compact battery charger features a built-in USB charging cable that stows away in a secure slot to save space and prevent damage. a brightly lit LCD display reports key battery information including battery type, capacity, voltage, charging status and health. Smart charging management automatically picks the correct charging current, prevents overcharging and protects against wrongly inserted batteries. 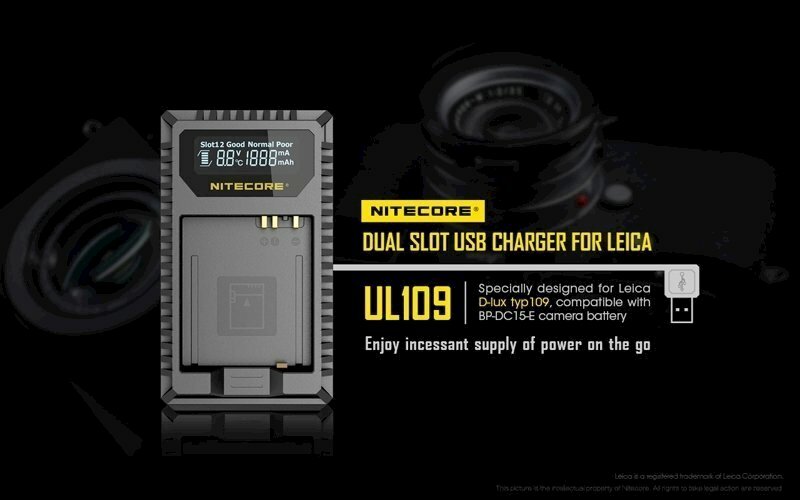 Compatible with many solar panels and power banks, the Nitecore ul109 is a versatile charger for at home and indispensable on the go.